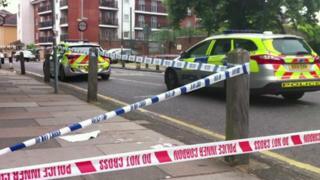 A man has died following a triple stabbing after a party in south-east London. The trio were stabbed after the licensed event at the Lyndeans Industrial Estate, off Felixstowe Road in Abbey Wood. The 26-year-old was found by police at about 05:00 BST after they had been called to reports of a fight. He died in hospital. The two other men, aged 24 and 26, have since been discharged from hospital. Scotland Yard has urged any witnesses to contact the force.